Day Five - Talbotville is bottom left and Buenba Camping Area top right. Mt Blue Rag is at end of track middle left. We were up again at the normal time and we left at 8:30 am. 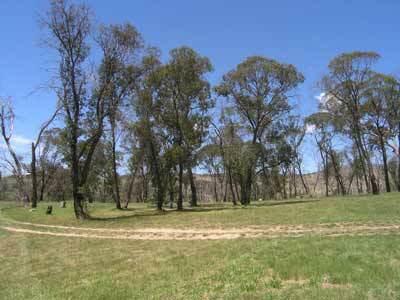 There are two ways out of Talbotville which both end up near Hotham Heights Ski Resort. 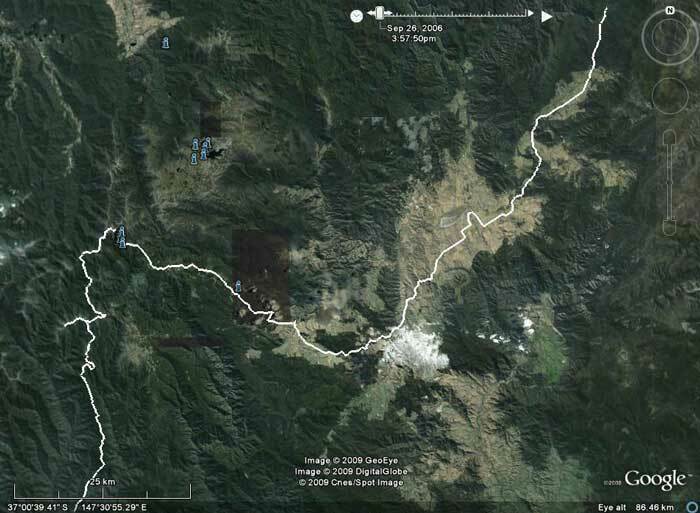 One is Brewery Creek Road (I presume that there used to be a brewery on the creek there when the gold rush was at its height) and South Basalt Knob Track (also shown as just Basalt Knob Track). The first one is the more gradual track that should be used if you are inexperienced. You cross the Crooked River again three times and then head up the hill. The South Basalt Knob is a very steep climb and is low range for at least the first 8.1 kilometres as your climb from just under 300 metres to 1160 metres. There is a helipad here (marked with a sign like HP1365). It took us 50 minutes to travel this distance at an average of 10 km/h. It is good to stop here as the views back to the south, west and east area great. You can also see the very easy route out that the campers and two wheel drive vehicles take to the east. After the helipad the track continues to climb but it is a more gradual incline. A further 3.5 kilometres brings you to the intersection with Brewery Creek Track and if you have some in your group who are hesitant about the track you have come up, they can meet you here. 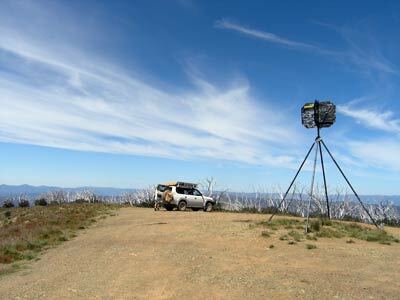 The track has been running on the top of the ridge since the helipad and you climb to almost 1500 metres as you pass Basalt Knob about 15 kilometres further on. Just over two kilometres on you come to an intersection. This is with Ritchie Road. This is very easily identified as there is a red coloured train truck here. This appears to have been a sheep or cattle truck as there is an overhead hopper that drops grain/feed into the inside or alternatively, outside. It seems to have been placed here as a shelter shed. At this location you turn left into North Basalt Knob Track and it stays at about 1450 metres for the next almost 10 kilometres. The going is slow on this section, not because it is particularly steep or rough, it is because the track is very overgrown and you need to take your time to avoid damage to your car. If you are worried about scratching you car, do not do this track. After the fires (in 2003 I presume) there has been a lot of regrowth and it is now about two to three metres high and particularly thick on the edge of the track. See the photograph near this paragraph. We averaged 12 km/h for the 9.5 kilometres. Towards the end of this section you start to climb again till you reach the intersection with Blue Rag Track. The height here is 1600 metres. 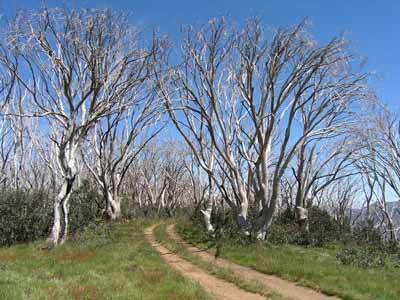 The road to Hotham Heights is off to the right but you may want to go out to Mount Blue Rag. I would recommend this but, and only but, if you are very, very experienced in difficult conditions (see why in a second). 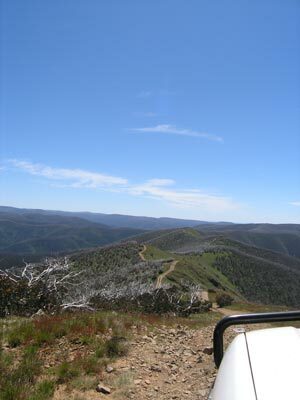 It is 3.8 kilometres out to Mount Blue Rag and the track follows a ridge that gives fantastic views (but do not look if you are driving). 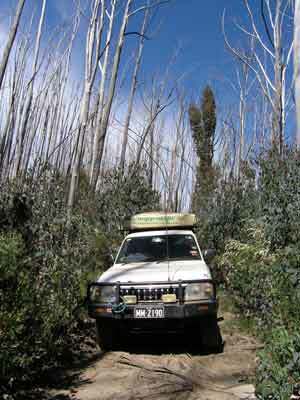 The track is right on the top of a ridge that drops away steeply on both sides and you climb another 80 metres or so. On the way out here, you need to be observant for other vehicles and you may need to stop as soon as you see one as the passing opportunites are limited. Just before the summit of Mount Blue Rag, the road is very steep and loose. It is low range first up this hill and even then I slipped and jumped as the tyres (admittedly not in great condition after 75,000 kilometres) bit and then lost their grip. However, it is worth the effort once you get to the top. There are 360° views from here. There are four other vehicles here when we arrive and we have morning tea at 11:05 am. The other vehicles head south further along the track. This goes down to the Wonungarra River at 530 metres. It is a one way track so unless you have some time, you need to go back the way you have come. We leave at 11:20 am and backtrack to North Basalt Knob Track and we turn left. 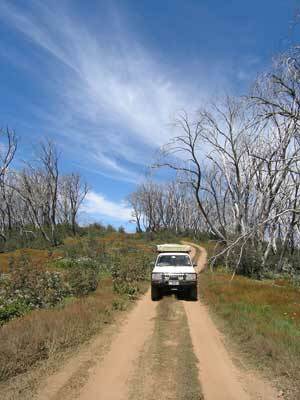 It is not far to the Dargo High Plains Road and we turn left and find this a relatively good gravel road. We average about 40 km/h and reach the Great Alpine Road at 12:10 pm. 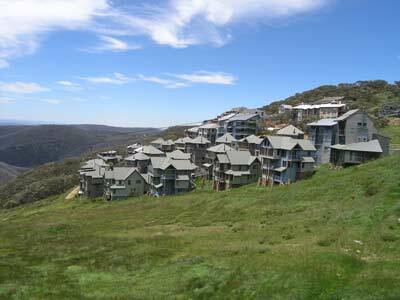 We turn right and 9.6 kilometres later we are at Hotham Heights and the Mount Hotham Apline Resort. We stop for 10 minutes to use the toilets and have a look around. It looks quite a nice spot and Kelly and I decide to come back one day for some skiing. We head off again at 12:40 pm and 35 kilometres down the road we pull into Victoria Falls Historic Area. This is very poorly signposted (as we have found a lot of things are in Victoria) and we were past the turn-off before I saw the sign (Kelly was driving). It is on a hard right turn just before you reach open fields. 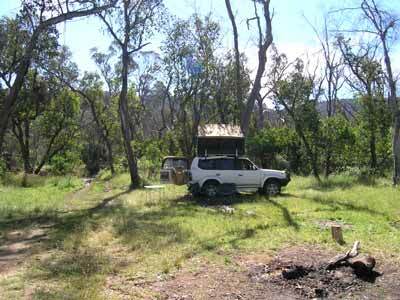 This is a very nice picnic and camping spot on a small creek. There are toilets, BBQs and tables with lots of green grass and shade. We did not see Victoria Falls as they are further down the track and we do not have the time to travel that far. We arrive at 1:10 pm and have lunch here, leaving at 1:25 pm. As you would imagine, the Great Alpine Road is tar and while windy, you can keep up a good speed. It is about 55 kilometres from Hotham Heights to Omeo and we arrive in Omeo at 1:50 pm, having taken only 55 minutes (excluding lunch). In Omeo we refuel, taking 109.1 lites at 146.9 cents per litre for a total cost of $160.27. This is an average of 19.1 litres per 100 kilometres. This is the highest consumption I have ever recorded for any period. However, considering that since Day 2, all but 100 kilometres or so has been using first or second (and sometimes third) gear high and also a lot of low range, it is not too bad. I need some batteries for the GPS unit as Kelly turned off the ignition a few times over the past week without turning off the GPS. This has totally drained the batteries and anytime we hit a bump that loosens the cigarette lighter connection, the GPS shuts down. 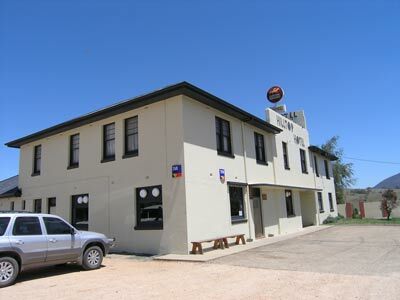 We also go to the Omeo Hilltop Hotel as we head north out of town on the Omeo Highway. We have a quick beer to cool us as the temperature has again risen to over 35°C. We are back on our way at 2:10 pm. A few kilomtres out of town we turn off onto the Benambra Road. This leads to a small town called Benambra. We do not stop in town but head out to the north-west again till we come to the Beloka Road. Here we turn left and head back out into the wilds. 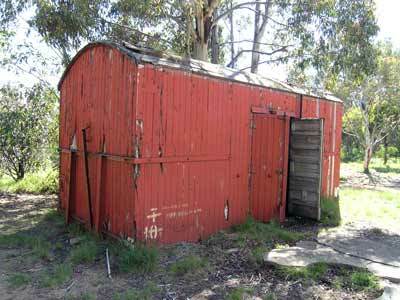 This is 38 kilometres from Omeo. This is a good dirt road and we average 60 km/h for the first bit and then about 40 km/h. We stop along the way to collect some firewood and in seven minutes I cut enough to last us for the night. We plan to stop at Buenba Flat for the night. 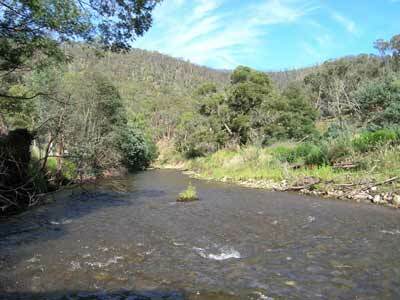 This is about 67 kilometres from Omeo and near where the Buenba and Benambra creeks join. This is not a formalised camping area as there are no toilets but you can camp on the right side of the road before the bridge, down a track to the left before the bridge or over the bridge to the right. We look at the first spot but it is totally occupied by a few vehicles. On the north side we find a spot with a BBQ but the grass is long and the creek appears to be a little way off. 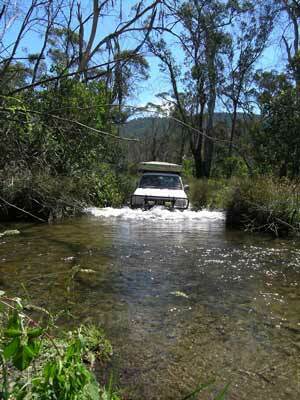 We continue down the track and about 1.0 kilometre off the road, we come to a creek crossing. On the other side of the creek is a spot big enough for two or three vehicles. This is perfect. 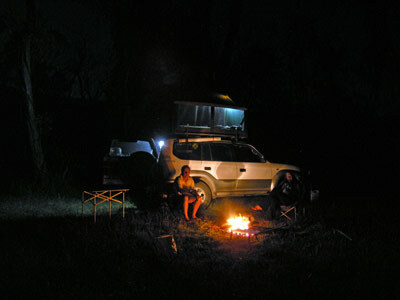 Kelly drives across the river and we set up camp. It is 3:50 pm. We then go and have a swim (well, a lie down) in the creek. It is not too cold and very refreshing as the temperature is still 34°C. A cold drink certainly adds to the enjoyment. The only bad thing about this site is that there are a few flies (not that many) but huge numbers of large March flies which bite a bit. The altitude is 880 metres. Around this time I notice that the back left tyre appears to be a bit flat. Kelly says that when we were cutting wood for the fire she noticed this but thought that it was the angle of the car. I check it and the pressure is down to 25 psi from the normal 40 psi. I check the tyre and can find no apparent object in the tyre. I get the compressor out and quickly pump it up to 45 psi. Today has been the longest distance of the trip (apart from the travel days at the start and end) but as a lot of it was on tar or good dirt roads, it was not too long a day. For dinner we have a barbecue of scotch fillet and sausages with a rice dish. After dinner, we go for a walk further down the track and find a huge open area that would provide camping spots for at least 100 cars. 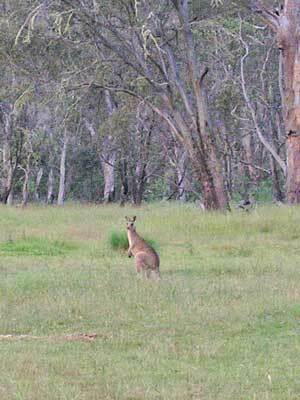 There are also quite a few kangaroos here. We sit back and watch the stars and see four satellites and two shooting starts. We go to bed and read for a while, sleeping at about 10:45 pm. Weather: Fine and hot, 36°C at Omeo but cooler up high.